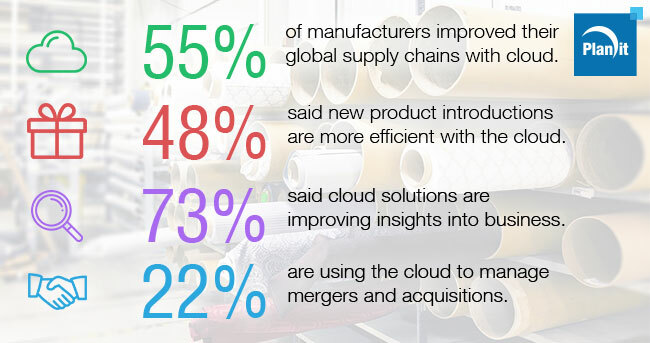 The Plex Systems State of Manufacturing Technology Report has found more than half (55 per cent) of manufacturers are achieving stronger management of their global supply chains thanks to the cloud. The added elasticity offered by the technology also helps many manufacturers (64 per cent) meet fluctuating customer demands. The report, which surveyed 197 manufacturers from different sectors, has found that the Cloud is being widely adopted by the industry. It is also bringing tangible benefits, with 48 per cent saying that cloud-based platforms and technologies are making new product introductions more efficient. Cloud solutions are improving insights into business for 73 per cent of manufacturers, which is higher than the 66 per cent reported the year before. 90 per cent are also noting improved mobile access to data. For many manufacturers, the cloud is delivering improved data access to manufacturing, supply chain, distribution, and customers. This is resulting in improved connectivity and communications with customers (65 per cent), suppliers (64 per cent), and transportation providers (40 per cent). Cloud solutions are enabling manufacturers to better scale up, with 22 per cent using the technology to manage mergers and acquisitions. 11 per cent are also using Cloud for their re-shoring of manufacturing operations, which in itself is a larger than expected number and runs counter to popular views of modern manufacturing. Manufacturers are using cloud technologies to enhance plant floor automation. Some of the ways the technology is helping is in sensors and machine integration (60 per cent), increased product innovation (32 per cent), and expansion into new business segments and geographical markets (27 per cent). Many manufacturers are optimistic about cloud platforms and technologies integrating personal devices and streamlining manufacturing operations, with 64 per cent reporting the use of consumer tablets on the plant floor. Of particular note is how much the cloud is responsible for improving personal data, plant and system-to-system integration. When looking to the next five years, the top initiatives manufacturers will undertake with the cloud include increasing supply chain connectivity (67 per cent), improving plant or enterprise integration (65 per cent), and enhancing quality programs (64 per cent). Quality management programs are a popular choice for automation with cloud-based systems since they are typically isolated from manufacturing operations workflows. What the survey results show is that manufacturing is more connected than ever before. By making use of the connectivity of and integration with the cloud, manufacturers are able to improve processes spanning raw materials to finished products, as well as suppliers to customers. The cloud is already being successfully used to put customers at the centre of manufacturing operations. Being cloud-enabled also puts manufacturers in a better position to respond to customer demands, which in turn leads to improved new products and streamlined supply chains. We’ve already assisted manufacturing companies with their digital transformations and improving their consumer experience. If you are looking for guidance with cloud-based technologies and solutions, contact us today to learn how we can ensure the best quality experience for you and your audience.